The Canadians Think Trump Will Kill NAFTA. Are They Right? The Canadians Think Trump Will Try to Kill NAFTA. Are They Right? 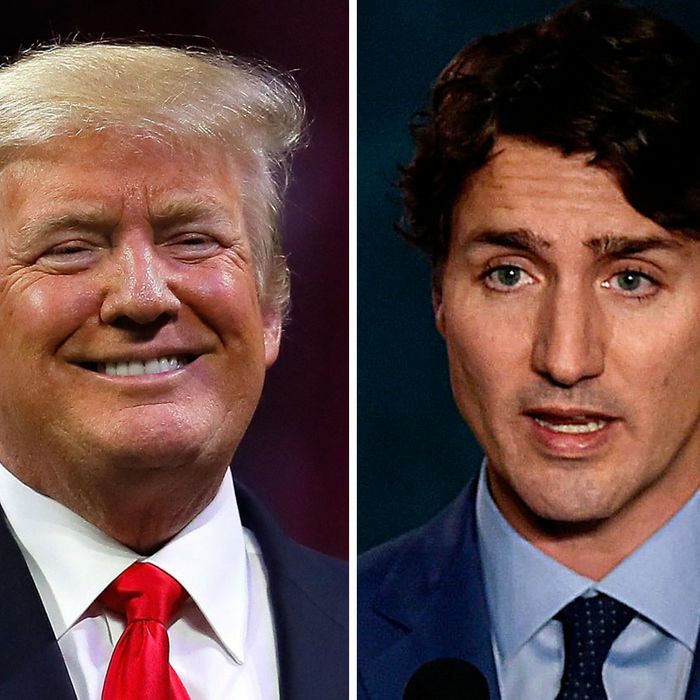 The Canadian government is “increasingly convinced” that President Trump will soon announce his intention to withdraw the United States from the North American Free Trade Agreement (NAFTA). Minutes after Reuters reported that development Wednesday, U.S. stocks slid as the dollar rose against the peso and loonie. If Trump does decide to pull out of NAFTA, it will be one of the most consequential acts of his presidency. Together, Mexico and Canada purchased $584 billion in U.S. exports in 2016; nearly 14 million American jobs owe their existence to trade on the North American continent; and countless U.S. firms have structured their supply chains around NAFTA’s rules. The move would be so disruptive — and attract such widespread opposition among powerful interest groups — that it’s difficult to believe Trump would go through with it. But then, it’s also difficult to put anything past this president. Here are three reasons to believe Trump will “rip up” NAFTA — and three to think that he won’t. Why the Canadians are right to be afraid. (1) The Trump administration has made a long list of impossible demands for reforming NAFTA — and stuck to them through four rounds of negotiations. The Trump administration’s deal-breaking demands have included “a sunset clause,” which would automatically end the agreement in five years, unless all three parties agree to extend it; a rule requiring all cars and pickup trucks imported to the U.S. from Canada or Mexico be constructed from a minimum of 50 percent American-made parts; and the curtailment of the investor-state dispute-settlement process, which allows tribunals of (predominately business-friendly) attorneys to arbitrate disputes between nations and corporations. The first of these proposals is bizarre — the American president has the power to initiate withdrawal from the agreement at any time, and the text of the deal is regularly renegotiated. The second is antithetical to NAFTA’s animating purpose, which was to promote duty-free trade across North America, while erecting a few light trade barriers against wares from other continents. And the third is actually, probably, a good idea, but still a drastic change to the status quo that the Mexican and Canadian governments have little interest in making. Mexico and Canada need to eliminate benefits that their corporate sectors rely on — or else there will be no agreement going forward. So, neither nation is likely to budge. And, to this point, the Trump administration has given every indication that it won’t take ‘no, to all of that’ as an answer. (2) Trump’s leash is (reportedly) getting looser. In private meetings: Trump keeps asking for tariffs — on steel and aluminum, in particular. He wants a trade war, and has for many years. His economic and diplomatic advisers persuaded him to delay trade actions in 2017. Those advisers recognize that the day of reckoning will come in 2018, regardless of whether economic adviser Gary Cohn and Secretary of State Rex Tillerson — who advocated restraint — stay or go. Cohn and Treasury Secretary Steve Mnuchin successfully persuaded Trump not to do anything rash while tax reform was being negotiated … Look for Trump to take action on trade in the next month. In all likelihood, Trump will find himself unable to pass major legislation in 2018 (the congressional GOP is far more unified on tax cuts for the rich than on any other subject). When their legislative agendas stall, presidents often begin using their executive powers more aggressively. With nothing to distract Trump from his deep-seated aversion to global trade — and heartfelt desire to deliver a “win” to his base — the risk that he’ll use the powers of his office (even more) impulsively in 2018 seems significant. (3) Trump is surrounded by anti-trade true believers. Steve Bannon may be banished but Lighthizer, White House trade advisor Peter Navarro, and Commerce Secretary Wilbur Ross are all genuine skeptics of the conventional wisdom on international trade. And some voices of Establishment reason, including Gary Cohn, are rumored to be eyeing the exits. On national security, Trump’s most destructive instincts have (generally) been checked by his advisers. But on trade, deference to the “adults” in the room could lead Trump to take radical measures. Why the Canadians have nothing to fear but fear itself (and/or, wildfires). (1) Trump has been nothing if not deferential to corporate America’s interests. For its complicity in the ascent of reactionary (white) nationalism, the business wing of the GOP has received a pliant federal bureaucracy, a looming neo-Lochner era in American jurisprudence, a booming stock market, and a Congress willing to pass giant corporate tax cuts over the public’s overwhelming opposition. Since taking office, Trump has stayed true to his campaign’s caustic anti-globalism when doing so would hurt vulnerable minority groups. But when adherence to populist nationalism would afflict the powerful, the president has generally told the White House’s “populists” to go cuck themselves. Announcing a withdrawal from NAFTA would be a radical break in Trump’s pattern of behavior. This president has done the GOP donor class’s bidding, even when that required him to tie his political fortunes to profoundly unpopular tax cuts and deregulatory measures. At this point, there are few things Trump could do to burn the goodwill he’s earned from Wall Street — ripping up NAFTA would be one. (2) Trump loves to brag about the stock market. After tweeting while watching Fox News, and eating cheeseburgers while watching Fox News, bragging about how high the stock market has risen (while watching Fox News) might be our president’s favorite pastime. As Wednesday’s market activity demonstrated, ripping up the rules that structure more than $1.2 trillion of trade on the North American continent would be an excellent way for Trump to make his bullish braggadocio unsustainable. In fact, if your were a Canadian trade negotiator — and wanted to put the fear of a market correction into the American president ahead of upcoming trade negotiations — telling a Reuters reporter that you believe Trump will soon withdraw from NAFTA might be a savvy move. (3) Trump has repeatedly walked right up to the edge of making a radically disruptive policy change — and then found some symbolic half-measure that leaves the status quo largely intact. Trump didn’t cancel the Iran Deal, he merely “decertified” it. He ended DACA, but immediately called for replacing it legislatively. He recognized Jerusalem as Israel’s capital — but not as its undivided capital, and declined to move the U.S. embassy from Tel Aviv. He announced his intention to withdraw from the Paris climate accord, but the United States can’t actually exit that agreement until after the 2020 election — and Trump has repeatedly evinced openness to rejoining the deal before the U.S. actually leaves it. Then again, one could read that last precedent in an ominous light. As with the Paris agreement, Trump could not withdraw from NAFTA overnight. He’d need to to give Congress six months’ notice of his intention to leave. And when Trump has been torn between a desire to have his populist posturing and his Establishment approval, too, he’s often lit such long-fused time bombs. The Canadian officials who spoke to Reuters did say that they believed Trump might see his announcement as a mere “negotiating tactic,” even though Mexico has previously insisted that it will not negotiate during that six-month window. All things considered, then, there’s sound reason to worry that Trump will announce his intention to withdraw from NAFTA — but not, necessarily, to think that he will actually go through with it. As of October, members of Congress and business groups were already putting together political and legal strategies for salvaging the deal during the six-month purgatorial period. If the past year is any guide, Republicans on Capitol Hill will give corporate America what it wants. But even an (ultimately aborted) announcement of withdrawal would hammer markets and slow economic growth in the immediate term — a point that Canada may have wished to convey, when it whispered to reporters on Wednesday.